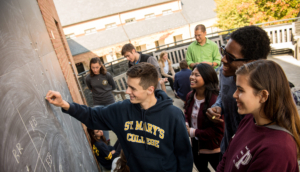 In May 2016, the Board of Trustees approved “A Time for Rebirth,” a new three-year strategic plan that builds on the St. Mary’s College (SMCM) charter as Maryland’s only public honors college and the first of its kind in the nation. The College has a rich history of providing a high-quality, liberal arts education to students who are prepared to learn in a rigorous and intellectually stimulating environment. As one of only two public honors colleges in the nation, SMCM teaches and empowers students to lead responsible and thoughtful lives as global citizens. The Strategic Planning Steering Committee tasked with developing the new plan included faculty, staff, and student representatives from the College. The plan includes an updated mission, vision, core values, goals, objectives, and metrics. The 2016-2019 strategic plan marks a milestone for the College as it begins with a new, revitalized purpose.